Master's Degree in Biological Analysis and Laboratory Diagnosis. 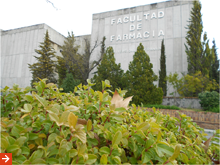 Master's Degree in Pharmaceutical Care. Research group agr-141 – Publications in the Web of Science JCR SCI (recent years). During the 1953 Pharmacy Curriculum the Chair of Applied Chemical Analysis and Food Science-Toxicology was created. In 1965 after the returning to the career of 5-year the Chair was renamed as Chemical Analysis-Toxicology and Food Science. Subsequently, departments were created, with the integration of the Chair in the Department of Biochemistry, Animal Physiology, and Chemical Analyses and Food Science-Toxicology. However, due to the disparities in discipline members this department was dismembered appearing the Department of Food Science, Toxicology and Chemical Analysis. The University Reform Law promoted a new management for departments, which culminated in 1987 with the creation of the knowledge areas. At that time the department was renamed to its current name of Department of Nutrition and Food Science, which involved the transfer of the teachings of Chemical Analysis to the area of Analytical Chemistry and those of Toxicology to that of Toxicology. Currently the department consists of 20 members of the Teaching and Research Staff (PDI), 2 members of the administration and service staff (PAS), and 3 research fellows. The teaching activities are focused in the Bachelors of Human Nutrition and Dietetics, Food Science and Technology, and Pharmacy. Additionally, the teaching activities include one subject in the Bachelors of Physiotherapy, Tourism, and that of Sciences of the Physical Activity and Sport. In the postgraduate teaching emphasizes the stewardship in the Official Masters of Human Nutrition, and Advances in Food Quality and Technology. Teachers of the department are also involved in the Masters of Pharmaceutical Care, Biological Analysis and Laboratory Diagnosis, and that of Social Studies and Immigration Intervention, Development and Vulnerable Groups. The research of the Teaching and Research Staff (PDI) of the department is conducted through the 2 research groups attached to it named AGR-141 and AGR-255.